The fireplace has evolved from purely functional to a decorative showpiece in the home. It transforms the room and becomes a focal point adding character and enhancing the home’s architectural theme. Even in hot climates such as Florida where Luxury Homebuilder Jorge Ulibarri designs and builds homes for all budgets, the fireplace is an essential feature. “A well-designed fireplace has a commanding presence. It serves as a social gathering spot inviting people to gather around the hearth to enjoy and admire one of the most dramatic spaces in the home,” says Jorge. He has several tips for designing a fireplace that makes a statement in any room. There are three elements to consider when designing a fireplace: the shape, the surround, and the tower finishes. Fireplace surround: There are many fireplace surrounds to define the architectural style. 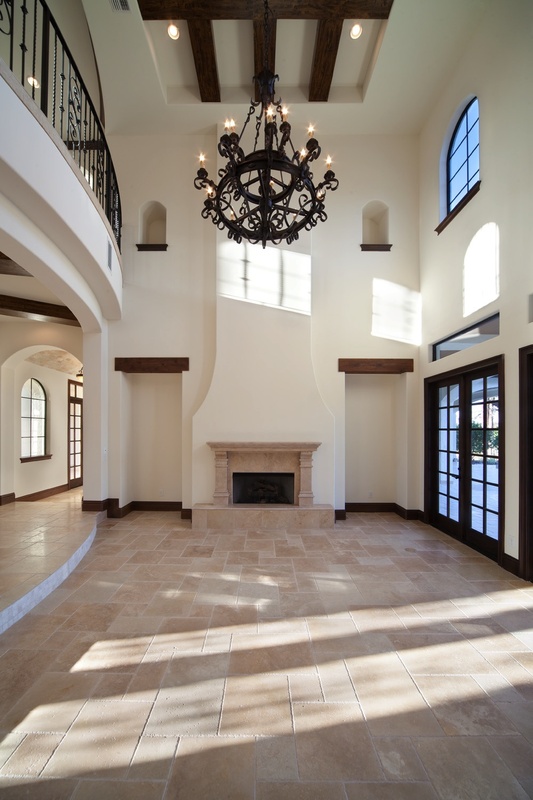 Some of the most common materials for surrounds include travertine, marble, precast and wood. Jorge typically uses fireplace surrounds made out of travertine or precast to suit the old-world style of his homes. Fireplace tower finishes: The selection of the tower finishes can be the hardest choice to make because they are the most visible elements of the fireplace. Depending on the size of the fireplace, cost will dictate the final selection. One example that incorporates these three design elements is the formal fireplace pictured here that Jorge created. It soars 24 feet with a travertine mantle and two columns sitting on a hearth. “This is a good example of how to spend money on the design and framing rather than expensive finishes. The total cost of this fireplace is $1,600. 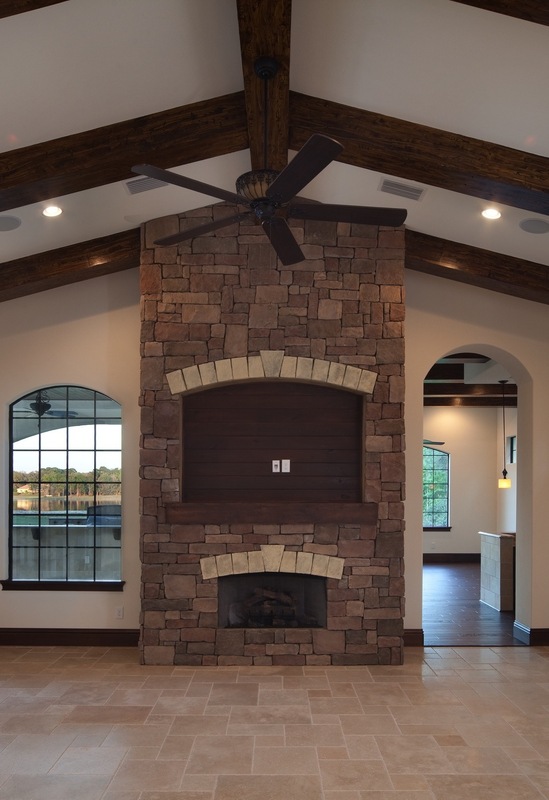 A money-saving alternative is to use precast stone instead of travertine, which will cost half the price.” Another option for this soaring fireplace is to plaster the whole thing all the way to the ceiling giving the room a Tuscan feel. The price to plaster the whole fireplace all the way up to the ceiling is $1,000 and it’s worth every penny,” says Jorge. Another example of a well-designed fireplace is pictured here in the family room. This stone fireplace features a wood beam as the mantle. An arched niche above the fireplace with tongue and groove as a backdrop serves as a built-in for the flat screen TV. Jorge says the fireplace finishes here cost between $2,500 to $3,000 and required two days of labor to construct. Another cost effective tip is to use a stucco finish on the fireplace surround and tower and use stone and wood as accents in key places such as a mantle, header or a heart. This will cut the cost down of the stone to a minimum and will still give it an authentic Tuscan-aged look.